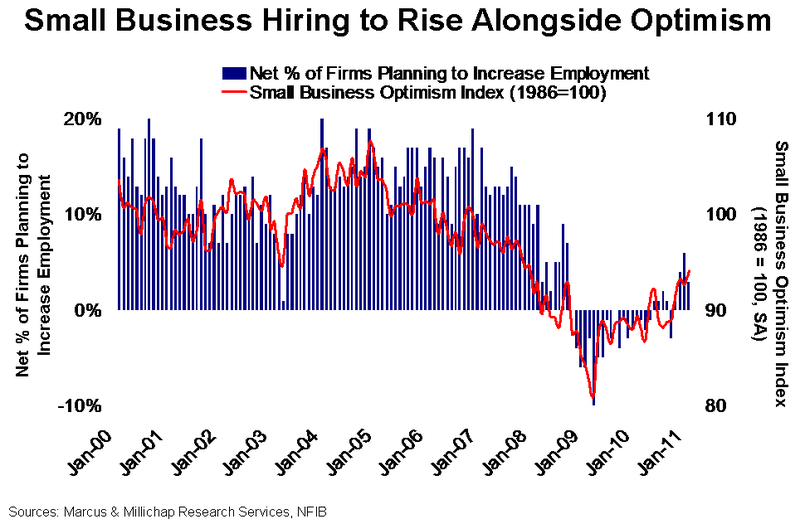 The outlook for small businesses, which historically account for two-thirds of new hires, continues to brighten, with the small business optimism index rising in January for the fifth time in six months. Though well below its peak in late 2003, the index reading is on par with pre-recession levels in 2007. Renewed optimism reflects easing credit conditions and expectations for stronger sales this year as the economy builds momentum. Recent upticks also follow the passage of pro-small business legislation late last year that offered $30 billion for small business lending, together with tax breaks to stimulate capital spending. While current levels of small business confidence suggest the sector remains cautious, this positive trend indicates hiring should strengthen in coming months. Small business hiring remained limited over the last year as the economy struggled to recover. Constrained access to capital, the lagging housing market and risks of a double-dip recession weighed on small business optimism. The recent resurgence in consumption and loosening credit conditions, however, have begun to stimulate growth plans. Over the past three months, small businesses substantively increased hiring plans for the first time since the summer of 2008, with up to 6 percent of surveyed firms signaling hiring increases. This trend will bolster hiring in 2011, doubling job formations from 2010 to an anticipated 2 million positions. Loosening small businesses lending standards also offer promise of a broadening economic recovery. Unlike large companies, which amassed stockpiles of cash in recent years thanks to strengthening demand and soaring worker productivity, small businesses have struggled to maintain their footing and remain at a significant disadvantage in the credit markets. Nonetheless, the lending climate began to ease for small businesses over the past six months, roughly half a year after loosening began for larger firms. In early 2011, approximately 2 percent of senior loan officers reported easing standards for loans to small firms, compared with 10.5 percent for larger companies. Furthermore, demand for loans from small businesses increased in the first quarter of 2011 after contracting every quarter since late 2006, signaling small firms have begun to regain sufficient confidence to consider expansion. Increased availability of credit and tax incentives aimed at boosting small business formation should translate into new retail concepts and rising in-line shop space absorption. Smaller retail centers were hit particularly hard by the downturn. Since late 2007, vacancy rates for neighborhood shopping centers spiked 400 basis points to 12.1 percent, well above the overall retail sector average of 10 percent. While a full recovery in smaller shopping center occupancy will take several years, owners should begin to see stabilization in 2011 as the small business climate improves. An increase in business startups should also benefit the Class B/C office market as small firms seek inexpensive space to launch operations. During the downturn, Class B/C office vacancy climbed to 18.6 percent, exceeding the Class A average by 200 basis points. While many companies remain hesitant to lease additional space, some tenants are taking advantage of opportunities to upgrade to better-quality properties at discounted rents. This trend likely will keep pressure on Class B/C rents this year, even as space demand from new firms escalates. This entry was written by marcusmillichap, posted on February 18, 2011 at 9:48 pm, filed under Research and tagged Small Business Credit, small business hiring. Bookmark the permalink. Follow any comments here with the RSS feed for this post. Trackbacks are closed, but you can post a comment.